White Rock Alehouse & Brewery was founded by two East Dallas locals who came together through their mutual love of craft beer. Located right off the trails of White Rock Lake, this alehouse and brewery strives to provide a fun and family-friendly establishment to bring the community together. With a large covered patio and outdoor beer garden, it will be the perfect spot to enjoy food and drinks this spring and summer! 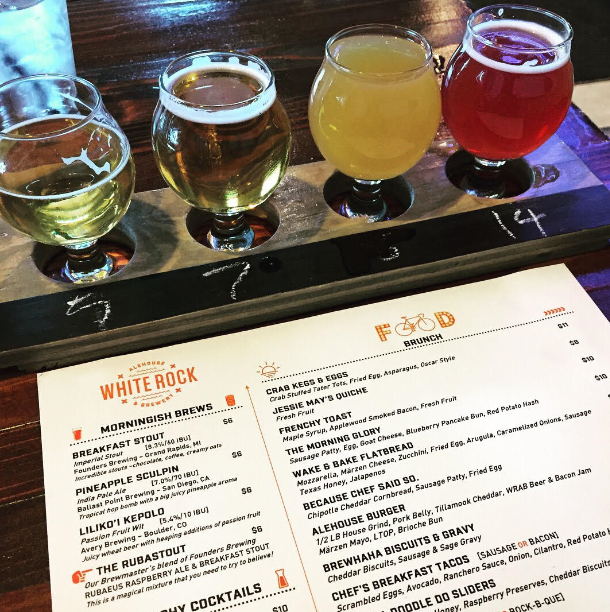 White Rock Alehouse & Brewery has an extensive list of 34 craft beers on tap and offer craft cocktails and wine. They recently began the process to start brewing their own beer as well! 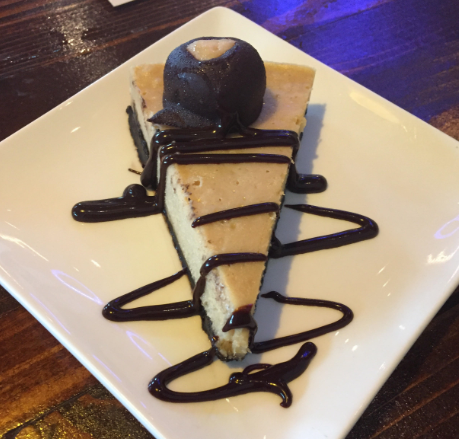 Not only does White Rock Alehouse offer some great craft brews, but they can whip up some amazing food! My guest and I were invited to try their new weekend brunch menu, offered on Saturdays and Sundays. I decided to forgo my usual brunch mimosa and started by ordering a beer flight to try out a few craft beers I had never tasted before. As an appetizer, we started with an order of the crab kegs and eggs. Typically called “Tater Kegs” on their daily menu, these are not your average order of tater tots. 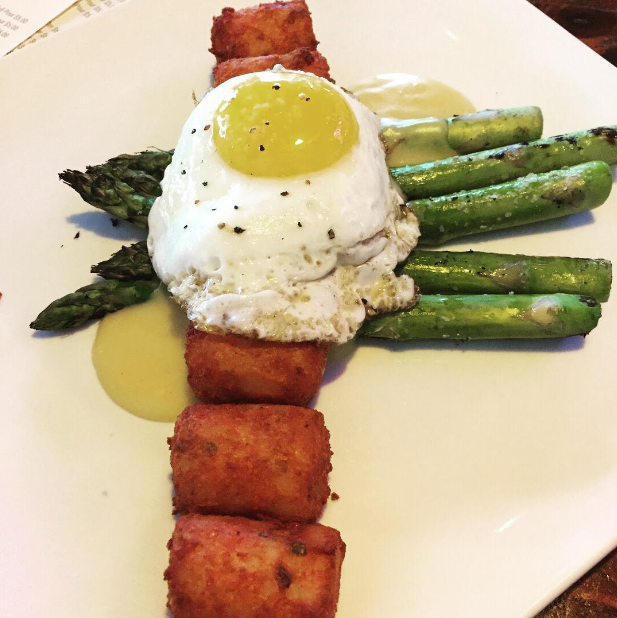 These jumbo-sized tater tot “kegs” are stuffed with crab, served oscar style with asparagus and topped with a fried egg. These pair perfectly with a craft beer and were a great start to a delicious brunch! For our main entrees, my guest and I ordered the chicken and waffles and one of the chef’s specials- shrimp and grits. 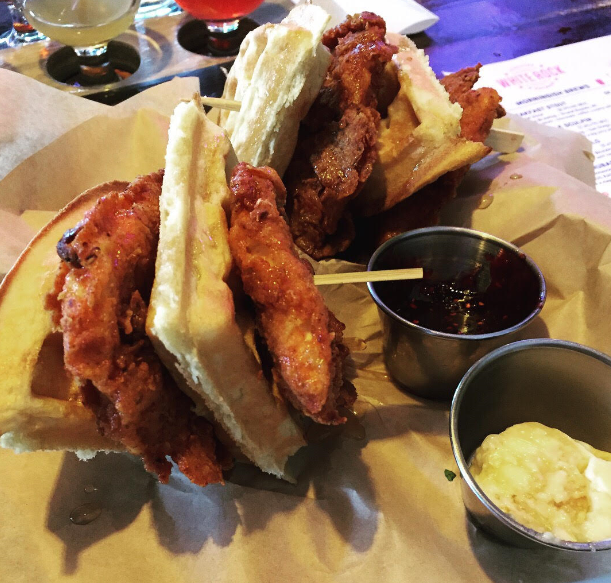 The chicken had a perfectly fried and crisp coating, stacked between two fresh waffles. It was served with a side of raspberry jam and fruit for a sweet balance to the savory fried chicken. 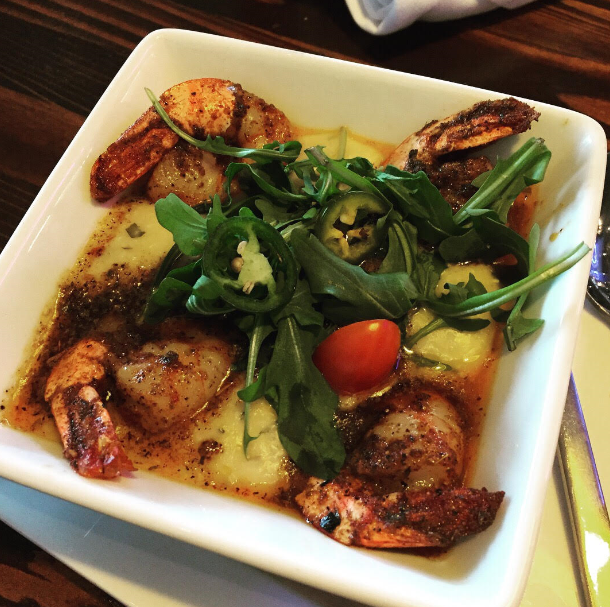 The shrimp and grits is one of the chef’s specialties, and I can certainly see why it is special! The shrimp were perfectly seasoned and cooked, and placed on top of a bowl of cheesy grits garnished with some fresh arugula and jalapenos. There was just enough spice in the dish for a nice kick and the grits were a perfect balance for the spice. We were highly impressed with this local spot and can’t wait to come back and try their very own craft brews and even more delicious food! White Rock Alehouse & Brewery is located at 7331 Gaston Ave. They offer happy hour Monday-Thursday from 3-6pm. $1 off all taps, $5 featured cocktail menu, and $2 off all flatbreads. Next Next post: Truluck’s is crabby. And we like it.